Before diving into an approach for finding alternatives, let me share my thoughts on some types of alternatives. The typical business case document contains a section for alternative solutions. There is often also a short explanation on why the proposed solution is preferred over the alternatives. However, many of these alternatives are rather predictable, like build vs. buy, or using new vs. existing technology. Furthermore, most of them cover alternatives for the whole of the solution, not alternatives to separate parts of the solution. These kinds of alternative solutions don’t propose a really different approach to achieving the goals of the project. Let me revisit the example of the loan application from a previous post. The original stakeholder requirement was “We need online data entry to improve our customer’s experience.” If we stick to this requirement, we will quickly come up with either alternatives of above generic types build vs. buy or new vs. existing technology, or detailed implementation alternatives like create an online workflow vs. create a full page web form. A problem with these kinds of alternatives is that they don’t offer genuinely alternative approaches from the user or customer point of view. They only offer alternatives on how to implement the proposed solution, but not on the solution concept itself. As an example, let’s revisit the “separated office room” solution in the benefit map of the loan example (see above image). Alternatives can be freeing up another room, or installing office space dividers. These are alternative implementation designs of the solution “separated room”, but they both stick to the concept of such a room. While these types of alternatives are useful, they only cover a limited range of possibilities for achieving our goals. The requirement sets up a predefined solution space, but we are missing alternatives for the solution concept. We are missing different ways of building with Lego as shown in the picture at the top. In the benefit map, you see how we added a level of requirements between the goals and the solutions. Starting from the requirement for online data entry, we reformulated it as a solution independent enabler: “Ensure private environment”. To achieve our goals, we have defined three such enablers. These enablers create room for alternative solution concepts: they define the opportunity space. A separated room in each of the company’s branch offices is one possible implementation design for the private “environment”, which should enable an increase of the applicant’s sense of privacy. Online data entry at home is another possible implementation for the same enabler (the private environment). These are alternative approaches to achieving our goal from the user or customer point of view, and I’m sure you can think of others. There is one alternative that is almost always an option worth considering: the “don’t do anything” alternative. Even if it doesn’t seem to make sense at all, it’s useful to describe why it doesn’t make sense not to solve the problem. This will help identify enablers and goals. In the loan example, our stakeholders would explain the reasons why not doing anything will lead to a decrease in customer satisfaction. But proposing to do nothing is a bit cheating: we are looking for genuine alternative solution concepts. What can we do to trigger our imagination? 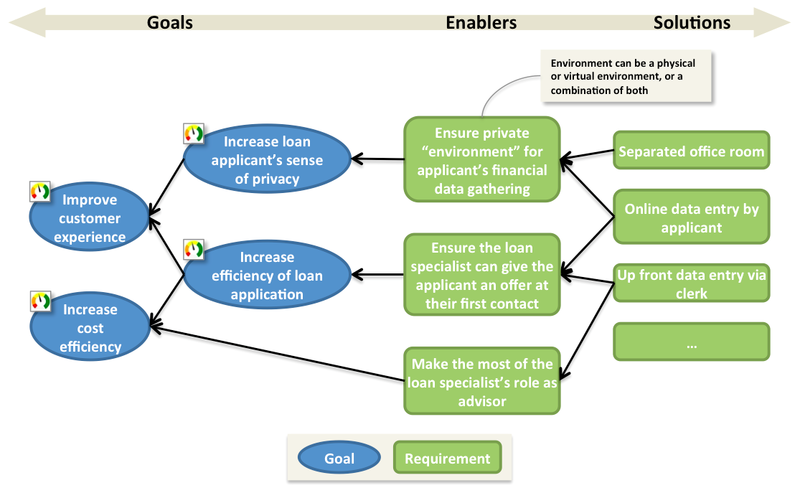 Well defined enablers should be a source of inspiration: they suggest a result that we can test (a private “environment” in our loan example) without saying how (separate room, online data entry at home, phone conversation, email exchange, …). So start from the solution independent enablers and come up with as many solutions as you can imagine. When are you done finding alternatives? I usually challenge BAs and stakeholders to come up with least three fundamentally different solution concepts (different in the sense defined above). I like simple metrics, like a number or a time box. They have you play the process without constraining the solution space. If you are willing to play along, setting a simple goal like this should be enough to get you going. There are plenty of creativity and ideation techniques available to trigger inspiration, while time-boxing the effort typically increases the amount of ideas that pop up. If you and your stakeholders have a hard time coming up with alternative solution concepts, you should probably revisit the enablers of your benefit map. Obviously, this only works if stakeholders are open to consider or at least think about alternatives. This is not always the case, so part of our job is to show them the merits of this exercise. This can be a hard sell: projects have deadlines, people have already invested their time in defining specific solutions, … Then we come onto the scene and propose to spend some additional time on other, possibly unrealistic solutions. Some resistance is to be expected. If this happens, think about your first reaction when someone tells you you may not need a new car, but should perhaps consider a subscription to a car sharing service instead. Give it some time, while gently guiding the thinking process and showing valuable aspects of the alternatives that pop up. What’s your imagination telling you, and how will you offer this to your stakeholders? Previous blog post on enablers: Finding the missing link between goals and solutions.